Wisla Krakow is one the city’s two best known sports clubs, the other being its arch-rival Cracovia. Since 1997 Wisla has been divided into two separate entities. The better known one nowadays is Wisla Krakow S.A., a commercial football club based in Krakow, Poland and incorporated as a public limited company. By contrast, TS Wisla has remained a municipal sports club interested in a wider range of disciplines from judo to basketball to swimming. TS in the name of TS Wisla is short for Towarzystwo Sportowe, Sports Association in English, whereas S.A. in Wisla Krakow S.A. equals the English abbreviation PLC and stands for words Spolka Akcyjna. TS Wisla and Wisla Krakow S.A. coexist and share the sports ground at 22 Reymonta street. Wisla Krakow is now Poland’s most successful soccer team. The club won the country’s 13 championships, namely in years 1927, 1928, 1949, 1950, 1978, 1999, 2001, 2003, 2004, 2005, 2008, 2009, and 2011. The Krakow football club also managed to secure twelve second places and ten third places. Plus Krakow’s Wisla prevailed in the Poland Cup on four occasions, in years 1926, 1967, 2002, and 2003, being a finalist ten times. And only three times in its 100-year-plus history Wisla Krakow was relegated from the premier league. Internationally Wisla Krakow reached once the quarterfinal of the Champions League in 1979 and it won the UEFA Intertoto Cup three times – in 1970, 1971, and 1973. Wisla holds the European football record of 73 home games in a row without a defeat. Between September 16, 2001 and November 11, 2006 the Krakow soccer team never lost on its home turf to a rival side. Long history of Wisla Krakow. Football was in the beginning. The origins of the Wisla club date back to October 1906 when the first soccer tournament in Krakow took place on the Blonia common. Four ad hoc teams of the city’s early football enthusiasts competed in the contest, and three of them would eventually unite in a club called Wisla in 1907. It was its first captain and goalkeeper Jozef Szkolnikowski who came up with the club name. As soon as the first football league was started in Poland in the early 1920s, Wisla Krakow joined the series. The club won its first championship in 1927. In 1997 the club’s soccer team was spun off as a public limited company in order to attract investors with capital needed to keep pace with changes in the Polish professional football. Wisla Krakow, the original Polish spelling Wisła Kraków, pronounced ‘veeswa krakoof’’, has been named after Wisla river (also known in English as Vistula) that flows through the center of the city of Krakow. The club officially adopted its name in 1907. The club’s emblem is a five-pointed white star. Its coat of arms features it on a red shield with diagonal blue stripe. 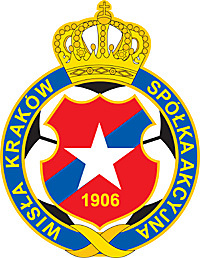 The club colors of the Wisla Krakow are red, white, and blue. Wisla Krakow football arena adjoins the city's vast Blonia common. Stadium of the Wisla club. Krakow’s Wisla Stadium, Stadion Wisly in Polish, is situated at 22 Reymonta street, ul. Reymonta 22, opposite the campus of the AGH University of Science and Technology. Built in 1953, the sports arena of Wisla Krakow can seat 33,300 after the expansion and a thorough modernization completed in 2010. Fifty seats (in section E) have been set aside and adapted for the disabled. A bay for the press corps accommodates 322 and is situated in section A. Also, facilities are provided for television and radio crews of 120. The playing field of the Wisla Stadium is 105 meters long and 72 meters wide and has heated turf. Contact info for Wisla Krakow football club. Apart from football TS Wisla Krakow maintains nine sports sections, i.e. women’s basketball, male basketball, women’s volleyball, gymnastics, swimming, boxing, shooting, judo, and bridge ones. The club’s professional teams, notably its basketball squads, as well individual sportsmen and sportswomen are among Poland’s best pros. Wisla Krakow’s leisure complex at 22 Reymonta street comprises the football stadium, a sports hall, and an indoor swimming bath as well as an open-air swimming pool, plus other sports facilities. The Hala Wisly hall may accommodate 2,400 spectators (1,600 seating and 800 standing) and it’s also a popular venue for musical concerts, ballet shows, congresses, etc. Copyright © 2008-2019 by MAREK STRZALA. All rights reserved.